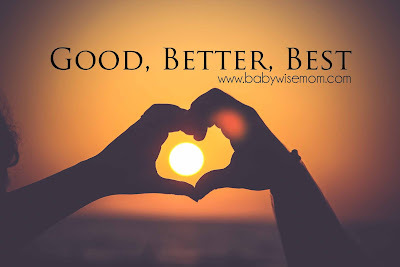 Back in 2007, before I even started this blog, I heard a talk given titled “Good, Better, Best” by Dallin H. Oaks. The opening line was “Most of us have more things expected of us than we can possibly do.” I had a 2 year old and a 5 month old and that line had me hooked. I know for me in my life, that has only become more true over the past 8 years as I have added two more children and have taken on little things like this blog, being the director of a musical each year, and currently being the president of the PTO at my children’s school…so yes, things have only gotten busier. That is really just the plain and simple fact that we have to face at some point in life if we want to maintain our sanity. Just because something is a good thing to do does not mean we should be doing it. There are countless good things to do in life. Our world is full of rich opportunities for growth and opportunity and we just can’t do it all. Our lives could take many different paths, but we can’t take them all. Consider how we use our time in the choices we make in viewing television, playing video games, surfing the Internet, or reading books or magazines. Of course it is good to view wholesome entertainment or to obtain interesting information. But not everything of that sort is worth the portion of our life we give to obtain it. Some things are better, and others are best. Not everything “is worth the portion of our life we give to obtain it.” This was true in 2007, but it is even more true in 2015 and I suspect it will become even truer as time progresses. The iPhone was first released in 2007. Before the iPhone, it was not commonplace to have a computer with you at all times. I personally didn’t jump on the train until 2010. Before then, I was unplugged from the Internet for most of the day. I didn’t have it in my pocket, able to pull out any time I felt a tinge of boredom. Now it is there all the time. In March of 2015, about 700 million iPhones had been sold. This is total, so obviously that doesn’t mean 700 million people have them. That is just the iPhone. Nearly two-thirds of Americans own a smart phone. That means two-thirds of us have instant access to the Internet almost anywhere we go! With this rise in smart phone usage, I have seen more and more parents looking for tips on how their friends control themselves with time spent on the smart phone. I have been a mom long enough to watch this shift happen. We spend a large portion of our lives pinning things we will never again look at, reading interesting articles, seeing who is offended by what on Facebook…we also pin things we will use (sometimes). We connect with friends and family through our phones. We can capture any moment with our smart phones. There are good things we can do with our devices…but is the portion of our lives we are giving to it the best way to spend that portion of time? Could we do the best things available with our phones and leave out the good parts? We also live in a world full of rich opportunities for our children. Most parents are eager to provide their children with every opportunity possible. Sometimes we overschedule out of fear. We fear if we don’t do all of the things available, our children will miss out on opportunities later in life–and sometimes that fear is perfectly justified. The trick is to remember the good, better, best hierarchy. If we do not have time to spend together as a family, the we are leaving out the best part for what is good or even what is better. If we can’t possibly squeeze in time for family prayers and for studying the scriptures together, we are leaving out the best part. Our children also need free time. We need to have mealtime together as a family. Why? …the time a family spends together “eating meals at home [is] the strongest predictor of children’s academic achievement and psychological adjustment.”3 Family mealtimes have also been shown to be a strong bulwark against children’s smoking, drinking, or using drugs.4 There is inspired wisdom in this advice to parents: what your children really want for dinner is you. We, the modern day parents, are pioneers. We are raising children in a world never before seen. We do not have the benefit of wisdom of our elders to ask, “How did you handle cell phones? What age did you get cell phones for your children?” and so forth. We can certainly get opinions, but no tried and true efforts. That is why this idea of good, better, and best can be of utmost value to us. As you decide how to spend your time, your family’s time, and allow your children to spend their time, always weigh the good, better, best. We really only have time for the best part.